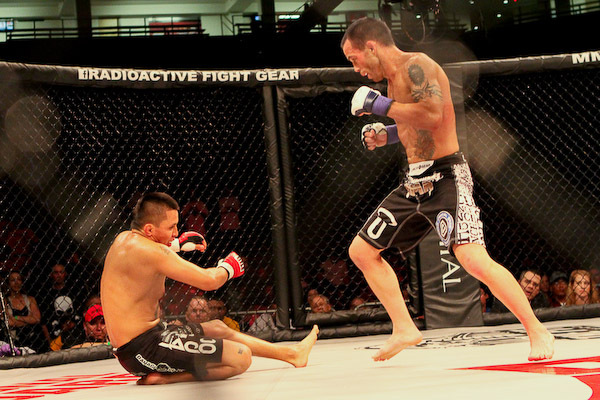 New Mexico has had its share of quality MMA events housed in several of the states athletic venues. King of the Cage had exciting shows at the Buffalo Thunder Resort & Casino, the Jackson’s MMA Series had audience pleasing events at the Hard Rock Casino, the Evolution Combat Sports promotion put on stacked fight cards in the Clovis area and so many more events and promotions. Even the ZUFFA owned WEC promotion made a visit with a show headlined by a Carlos Condit title fight. A lot of fight fans forget memorable moments over time and some fans are embracing their MMA fandom later then others making moments like those mentioned events lost in the archives. In an attempt to fix that issue, SWFight.com is doing a time retrospective to remember a past event’s epic stature in the chronicled history of New Mexico’s MMA regional scene. On August 11th, 2011 there was a show held in Albuquerque inside a venue that had very sparingly seen mixed martial arts action. The MMA Fight Pit promotion would host an event labeled “Genesis” inside the State’s famous venue “The Pit” which is home to the University of New Mexico’s collegiate basketball team and a place of historical sports fame as it has been featured as one of the toughest places for opposing teams to win. The MMA Fight Pit featured ten New Mexico fighters out of the 10-fight, 20 fighter card. Of those ten, two fights were match ups between two non-New Mexico fighters. The Main Event was a Light-Heavyweight bout between former UFC fighters Houston Alexander and Razak Al-Hassan and in the undercard Texas based Sean Spencer fought Colorado’s Ali Hanjani. Two fights also consisted of two locals fighting one another as the two opening bouts were between Santa Fe’s Mark Lujan and Albuquerque’s Rocky Ramirez and in featherweight action; Farmington’s Guy Youell was paired with Albuquerque’s Conrad Padilla. New Mexico saw mixed results over the course of the event when it came to the rest of the match up going 2-4 in six bouts containing a New Mexico fighter opposing a fighter from outside the state lines. 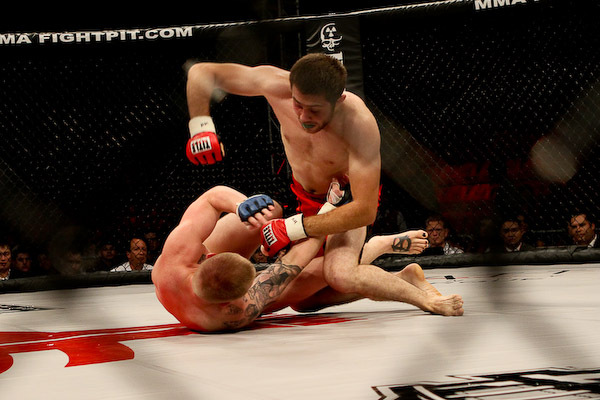 With the background information set, we now will look at MMA Fight Pit’s 4 most memorable moments. In a match that was billed as a fight for former TUF Bad Boy Junie Browning to turn his career around, Jacob Clark never got the memo. Forcing a unconditioned Browning to succumb to another loss. 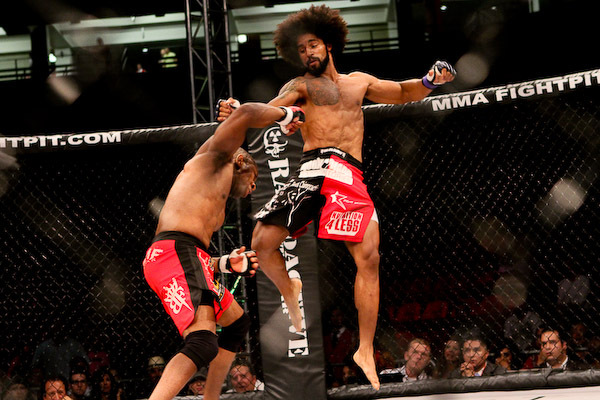 Fight fans knew Junie Browning from the UFC’s Ultimate Fighter 8 reality show where he would make a name for himself outside of the cage more so then inside it. Browning was a character on the show, constantly being involved in altercations and moments of clear alcohol over usage. While he would not win the show, he would compete twice for the UFC posting a 1-1 record. After being cut from the UFC, Browning would travel around several regional scenes. During that trip Browning would find himself matched with Farmington’s Jacob Clark who was at the time 8-3 as a professional. Clark would come into the fight training out of Team Four Corners and while Browning had the less impressive record; Clark was considered a sizeable underdog due to being a late replacement and not having the name recognition as Browning. While Clark was known around New Mexico for his submission prowess, he would diligently and effectively pick Browning apart in the stand up game and when the fight did hit the mat, Clark would continue his dominance. An obviously exhausted Browning would succumb to Clark’s ground and pound where the ref would stop the bout near the end of the first round due to elbows from top position. Clark would secure the win after an impressive performance and would be one of two New Mexican’s coming out of the event with wins over out of state fighters. Ultimate Fighter 11 alumni Jamie “The Choysn 1” Yager was a standout on the reality show displaying video game-like combinations and fight ending finishes. Despite his high energy and flashy style, Yager was notorious for not having the gas tank to go three rounds. After his UFC release, Yager picked up a regional win and ended up in Albuquerque facing off with a very tough middleweight. Willie “Slick” Parks was entering into the contest unbeaten in his career with four professional wins to go with his two amateur victories. Parks unblemished record complimented by his wrestling pedigree had earned him prospect status and made him a “must watch” fighter for fans and bigger promotions alike to keep an eye out for. Many heading into the bout believed wrestling would be the difference as Yager’s eccentric style made it easy to get takedowns. The fight would be intense from the get go as Yager would fly with knees and kicks as Parks attempted to box from inside and get the fight to the ground. While Parks would win in the grappling department, Yager came out ready to strike in round two and when Parks shot in for the double leg it was answered with a guillotine choke from Yager. The choke was too deep to fight out of and Parks was forced to submit. Yager would climb the cage to celebrate and Parks was left in the middle of the cage clearly disappointed. “Little Evil” Jens Pulver beat the hometown “Ox” Wheeler and showed glimpses of the legendary talent we all knew him to have. The former UFC World Lightweight Champion was probably the most notable name on the entire fight card despite being relegated to co-main event status. Regardless, Jens “Lil Evil” Pulver was on a mission on August 13th. Making his bantamweight debut, Pulver was ready to relive some of that success he had when fighting notable opponents like B.J. Penn, Caol Uno and Joe Stevenson. Jackson-Winklejohn product Coty “OX” Wheeler was easily the most well known and popular New Mexico fighter participating in the event. “OX” was a WEC standout and one of the more interesting characters in the state’s roster of fighters. Known for his flashy style, Wheeler was unafraid of trying any type of move inside the cage and was on a two-fight win streak coming into the bout with Pulver. Pulver showed very early on that his knockout power as a lightweight stayed with him 20-pounds lighter as it was evident immediately that when Pulver landed a strike, Wheeler was stunned by it. Dropping the Albuquerque trained fighter several times, Pulver remained calm in his onslaught eventually forcing the referees hand early in the second round as Wheeler could no longer keep his balance after repeated knockdowns. Despite Wheeler’s effort to land his kicks and punches, Pulver proved to be too powerful on that evening. Despite not getting the Judge’s nod, South Valley’s Angelica Chavez fought in a classic against Diana Rael. Serving as the evenings lone WMMA fight, Angelica “South Valley’s Own” Chavez would make the walk to the cage representing Chavez Dojo to face off with Serial Boxe’s Diana Rael. Chavez would enter the bout undefeated and Rael would have the experience of a veteran with over seven bouts both amateur and professional. Chavez was a technical striker and had shown in recent bouts her improved submission skills while training alongside World Jiu Jitsu Champion Rafael “Barata” de Freitas. Rael was an experience fighter with skills sculpted in all facets of MMA. The two even matched fighters would show quality match making as they would battle back and forth for three rounds. Chavez would find success on the feet, Rael would land her strikes in the stand up; Rael would score from top position on the ground, Chavez would defend with submissions from her back. The two pushed a frenetic pace, challenged each others cardio and really put it all on the line. Much to the chagrin of the crowd who was pro-Chavez, Rael was awarded a razor-close split decision. The girls impressed in their performances despite the conclusion not being favorable for Chavez and her hometown crowd. While there was not any official post-event bonuses, it was clearly the evenings “Fight of the Night”. The MMA Fight Pit ended up only being a single event as to date the promotion has yet to announce any future bouts. However, it provided a huge night for fans of MMA in New Mexico. The main event featured former UFC Light-Heavyweights Houston Alexander and Razak Al-Hassan in what at the time was one of the more notable match ups to take place in our state. The show also took place in a great venue as “The Pit” was able to host a MMA show that provided great seats all around due to its stadium seating. Whether you were in the front row or the very top of the bleachers, fight fans had a great view of the action. The show offered a glimpse to several fighters who would go on to other prominent opportunities. Jason Sampson defeated hometowner Josh Montoya and is now signed on to Bellator for which he has an unblemished record. Montoya despite the loss went on to avenge the loss to Sampson and also fight for the Bellator promotion. Sean Spencer would fight for the UFC and Jens Pulver would take his talents to the OneFC promotion. Rocky Ramirez would also join the Bellator ranks and WMMA’s Angelica Chavez would take her talents to the all-women promotion Invicta FC. In closing, the show was a solid event that can be added to the rich, vibrant history of combat sports within New Mexico. While the home town fighters didn’t come out on the winning end more often then the out of towners, each and every one fought hard and made their home crowd proud. Stay tuned for more history pieces and fun articles detailing the past memorable moments of New Mexico’s fighting scene.